FRISCO, Texas—Failing to qualify for the Olympics for the second straight cycle–for the first time since the 1960s–as the United States did on Tuesday after a 2-1 loss to Colombia in an intercontinental playoff, marks another low point for youth development in the country. It’s not the only recent disappointment, but it caps an abysmal period of major competition for the youth national teams. The Under-23 team lost, 3-2 on aggregate, to Colombia. 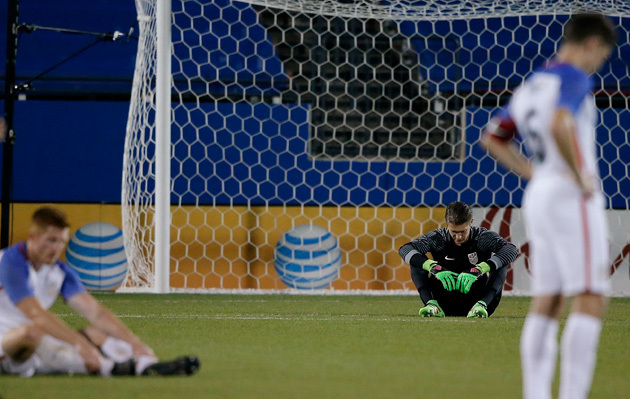 The U-17s crashed out of the 2015 World Cup without a win in the group stage. The U-20s did a bit better, making it to the 2015 World Cup quarterfinals where eventual champion Serbia won on penalties, but they started the tournament with only a narrow win over Myanmar and generally struggled to control games besides their 4-0 win over host New Zealand. What remains to be seen now, as U-23 head coach Andi Herzog said in his press conference on Tuesday, is whether this will become another “lost generation” of American-developed players, as technical director Jurgen Klinsmann has classified past teams. Overcoming this failure will be a major challenge for the group of players Herzog called in for the CONCACAF qualifying tournament in October–where the best opportunity to reach Rio was squandered–and this two-legged playoff series. A few of the players in the group have already been hailed as the potential future of the national team, including goalkeeper Ethan Horvath, center backs Matt Miazga and Cameron Carter-Vickers (who missed the Colombia playoff due to injury), central midfielders Wil Trapp and Emerson Hyndman and forwards Jordan Morris and Jerome Kiesewetter. Of those, only Horvath and Trapp consistently performed well across the qualifying competitions for the U.S. The others, and the team in general, were plagued by inconsistent showings that don’t inspire confidence on the international stage. Opportunities for U.S. players to showcase themselves in globally recognized tournaments don’t come as often because they play in CONCACAF. With no Olympics on the immediate horizon, they will have to turn to their clubs to progress their careers. That becomes increasingly difficult in a domestic environment that hasn’t yet proven its ability to develop players that can consistently compete with the best in the world. The constant spats between national team staff, Klinsmann in particular, and Major League Soccer officials doesn’t make for the kind of harmonious relationship that would be helpful in this endeavor. The worst of the blow-ups, between Klinsmann and commissioner Don Garber in 2014, has supposedly passed. However, franchise owners have also been recently critical of the national team. At the same time, Klinsmann claimed that he has never been given a chance to sit down with MLS owners and explain his vision for the U.S. programs. Contrast that with Colombia manager Carlos Restrepo’s comments after Tuesday’s win, lauding the symbiotic nature of the nation's domestic league and youth development, and it shows just how far the U.S. still is from the gold standard of international football. It’s been 24 years since Los Cafeteros qualified for the Olympics, when they finished bottom of their group at Barcelona 1992, prompting the federation’s current project to get back into the tournament. In the end, it’s individual player development that takes the biggest hit in these quarrels, taking with it the fortunes of U.S. teams current and future. Whether the current U-23 players end up being eventual successes or flops at the senior level, their ceilings have been prematurely restricted by myopic attitudes and an inability to develop at an accelerated level. Playing in the Olympics isn't the end-all–Spain, for example, is missing out in 2016, but its development system is among the world's finest. Instead, it's the overall failure to compete regularly with the rest of the world that is the red flag. The proof was on the field, both in Barranquilla and Frisco: Colombia outplayed the U.S. in at least three of the four pillars of the game (technical, tactical, physical and psychological). The only spot where American players can consistently perform with the best in the world is physically, which is part of the reason the U.S. has produced multiple top-level goalkeepers and so few field players. An open dialog between Klinsmann and MLS, without snap judgments and the airing of dirty laundry in the media, could only be mutually beneficial. Otherwise, the U.S. will be doomed to repeat the cycle of disappointment as its players reach the age of professional maturity. Of course, it’s always easier to be optimistic when you’ve just won and pessimistic in losing situations. That doesn’t mean the clues hidden among the spoken words should be ignored, though.